Cross the mighty Rhine Delta that straddles the border between Austria and Switzerland and encounter wonderful wildlife, including kingfishers hidden in the reeds. Take a refreshing dip in the turquoise waters during stop-offs, visit half-timbered frescoed towns for lunch (kretzer (perch) and zander (pike-perch) are Konstanz specialities), and then admire the myriad of Baroque churches and Gothic cathedrals. Brimming with historical and cultural highlights, jump off your bike to visit fairytale Meersburg boasting twin castles, steep streets and vine-covered hillsides. Get a true taste of Germany when cycling through the Bavarian vineyards - local Muller-Thurgau wines come from Riesling and Silvaner grapes for which Lake Constance is famous. For chocolate-lovers, mediaeval Stein am Rhein boasts an array of lovely chocolate shops, and you can visit the C11 monastery while you're there. After arriving at your hotel, a historic coaching inn, in the centre of Bregenz, you can explore the ancient cobbled streets of the old town before dinner on the courtyard terrace. Today you'll cycle west along Lake Constance's southern shore before crossing the mighty Rhine delta that straddles the border between Austria and Switzerland. It's an area of great natural beauty and a refuge for wildlife - be sure to keep your eyes peeled for kingfishers in the reeds. Your final stretch takes you around the lake to historic Arbon where you'll find pretty half-timbered houses and a C16 castle. There are two routes today - if opting for the shorter route you can take the train to Guettingen this morning. Otherwise, you'll pedal clockwise around the lake and pass waterfront villages affording lots of panoramic sun terraces for coffee stops and lunch. In the afternoon, you coast effortlessly between sleepy harbours before arriving in mediaeval Stein am Rhein. After freewheeling east this morning, you'll soon cross the border to enter Germany. In the Hornstaad Nature Reserve you may spot cormorant and red-crested pochard. Cycling along the Gnadensee you'll soon reach the UNESCO Heritage Site of Klosterinsel Reichenau, the first populated area on Lake Constance and home to an impressive C8 Benedictine abbey. It's then on to the unofficial regional capital, Konstanz. Today you can spend the day exploring the narrow streets of Konstanz: visit the Altstadt, Munster and the lively centre crammed with quirky shops and museums. Alternatively, you can hop on a boat (payable locally) to visit Mainau Island's palace and landscaped rose gardens. If you take your bike, you can pedal back at leisure along traffic-free lakeside cycle paths. Pedal through oak forest this morning to catch the 15-minute ferry ride (included) to fairytale Meersburg - built on a steep vineyard right by the lake, it boasts twin castles and many museums. It's a perfect place to stop for lunch! Then, pedalling south, it's a gentle cycle into Friedrichshafen. Today you head to lovely Lindau, a stunning island village surrounded by cobalt blue waters with long-distance views of razor-edged peaks across the lake. En route you cycle past the pretty village of Langenargen and through peaceful vineyards and cherry orchards. After lunching in an idyllic setting near the lake, a final push alongside the lake takes you back down to Bregenz. Time permitting, you could take the cable car up Pfander mountain (1,064m), for a fantastic vista of your entire route, giving you a real sense of achievement! Please note that cycling helmets are compulsory in Austria for all customers under 12yrs. As we are unable to provide these, we strongly recommend that you bring your own. 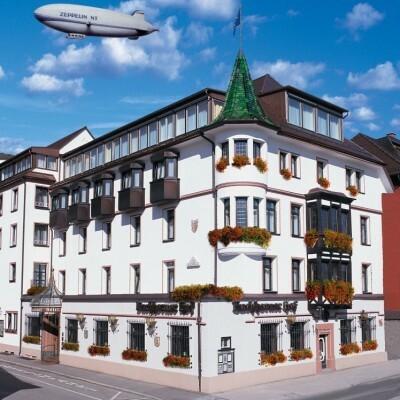 The Hotel Weisses Kreuz is an old coaching inn, and it's central location makes it perfect for exploring Bregenz; it is only a couple of blocks from the lakeside and about a 5-minute walk from Bregenz station. Bregenz is on the eastern shore of Lake Constance, close to the 'four-border corner' with Germany, Switzerland and Liechtenstein. The building has been impressively modernised in the last few years - bedrooms are spacious and light with dark carpets, light wooden furniture and big windows onto the street at the front or onto courtyard and the old town at the back. Suites - have a separate lounge area. 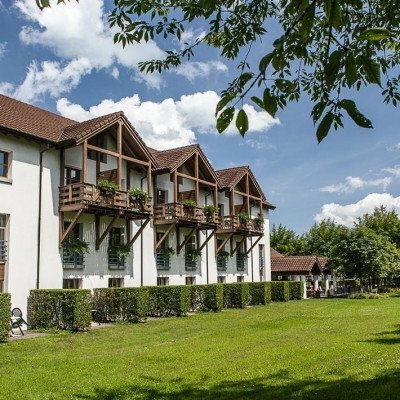 The 42 room Hotel Seegarten is on the outskirts of Arbon set amid large gardens and fields. It is a short 5 minute cycle to the marina and the centre of the village, and very close to the Arbon Strandbad - the waterfront swimming area that serves the village. The rooms have been furnished in a simple but modern style, with neutral colours and each of the modern rooms are equipped with direct dial telephones and televisions. 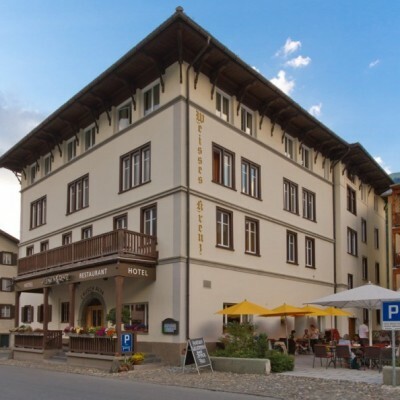 Historically, this family-run hotel dates back to the C15 and was originally a customs warehouse for goods such as salt being transported up and down the Rhine River. It was also a guild house. 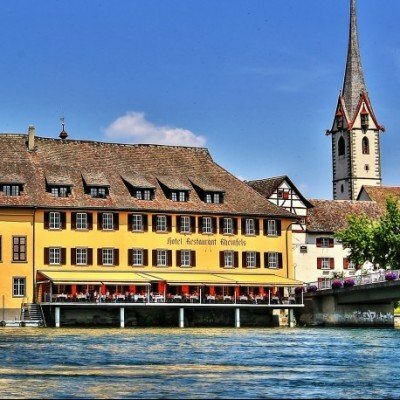 The hotel is located right on the River Rhine at the north end of the bridge in Stein am Rhein. There are 16 spacious and light rooms with ensuite bathrooms with bathtub and/or shower, WC, hairdryer, minibar, TV, radio alarm clock, free Wi-Fi within the hotel, direct dial telephone, safe and a unique view of the Rhine. The restaurant offers traditional cuisine using fresh seasonal ingredients. There is a terrace with fabulous views over the river. The restaurant is closed on Wednesdays (excluding during July & August). The hotel also has a boat for trips up the river and onto the lake - the MS St Georg, that seats up to 60 passengers. The Hotel Halm in Konstanz is a grand central hotel separated from the waterfront by the railway station, so you can shorten the cycling on this day, as the train will drop you at the front door! It is an impressive historic building with views from many of the rooms out over the lake, and it is located right in the heart of the town, which is why dinner has been left up to you in Konstanz - the town is full of restaurants and cafes squirreled away down cobbled streets as well as along the waterfront by the harbour, so it is a pleasant place to stroll around before and after a meal out. The interior is impressive - there is a grand reception area and bar, and a rather incongruous Moroccan style dining room with very high ceilings which is rather unusual, but very lovely nonetheless. Bedrooms upstairs are light and modern, and the breakfast here is a feast fit for a king! The Hotel Buchhornerhof is located overlooking the waterfront, on the road leading into the town centre - ideally situated for a stroll. It is a traditional building with a turret on the corner, and lots of attractive window boxes filled with flowers. Inside it retains a traditional charm, with wood panelled walls, stuffed animals on the walls, stained glass windows and snug corners with leather sofas where you can relax with a drink from the attractive horseshoe shaped bar. The bedrooms here are light and modern and equipped with all the mod cons you would expect in a 4 star hotel. Room upgrades: Comfort room or Suite. Comfort room: Rooms are slightly bigger rooms (28 m') and have air conditioning. Junior Suite: The Junior Suite is equipped with lots of comfort and offers separate sleeping and living areas in a very spacious accommodation with bath/shower, hair dryer, telephone, TV, a minibar and air conditioning. Suite: Has two floors, the sleeping area is upstairs and on the lower floor is the living area. Bath/shower, hair dryer, telephone, TV, minibar and air conditioning. In addition there is a wonderful view over the lake which you can enjoy directly from the balcony. Transfers from and to Bregenz train station (pay locally, allow approx 5 euros each way). Great way to explore a region little visited by Brits. Despite no Headwater rep and notes which show their age (and accuracy) the maps and general set up for cycling made this a great holiday. A very good holiday package around a great lake for cycling. an excellent location for an easy cycling holiday with many options to vary the length of the cycling day due to the number of stations close to the route. Beautiful lake with some great cycles - different scenery every day. Perfect iced coffees and strawberries for sale on the way. A fantastic holiday all round; great bikes, great route through 3 contrasting countries around the Bodensee. A wonderful opportunity to travel by bike and to explore at your own pace and under your own steam. A unique experience ! At the end of a busy academic year two teachers find this the ideal way of switching off and relaxing. All we have to do is pedal by day following pre designated tested routes, often along traffic free cycle paths , then feel fully justified in eating wonderful meals we know will be waiting for us at good local hotels, all booked and waiting to welcome us. Every two days from 25th Apr 2019 to 20th Oct 2019, for 7 nights. All dates are subject to availability, please contact us to check. It is possible to hire electric bikes for this holiday at a supplement of £85 per person. As these are available on a first come first served basis, we recommend early booking to avoid disappointment. There is no free parking in Bregenz. We can pre-book car parking for you for £81 or you should budget to pay locally approx 120 euro for 11 days. Self-drive prices: Above prices include Eurotunnel. (Please note vehicles fitted with either LPG or CNG fuel are not accepted for travel on Eurotunnel). Due to the tailor-made nature of our holidays, we need a little more information in order for us to check availability for Highlights of Lake Constance by bike. Simply complete the form below and a member of our sales team will contact you (when it's most convenient for you) to provide availability information, travel options and an accurate price. Of course there's no obligation, but if you do wish to proceed with a booking they will be on-hand to assist you throughout the process.